Lugaru is a proprietary game. The Lugaru source code was released under GPL. The Lugaru game data was released under a "freely redistributed for non commercial purposes" license. Here's an explanation by Wolfire but it's basically just like Quake, only that the Quake game data was never released for free and never with the engine code and that they used a zip file, not a repository. "we have every legal right to market and sell the software"
"the license we were granted allows for non-exclusive redistribution of the source code or the compiled product, modified or unmodified, for a fee or free of charge." Wolfire wrote a blog post when they found out about this and another one when the cloned product was finally taken down. "While released source code in no way makes it legal to sell someone else's game, it is apparently enough to make scammers think they could get away with it, and that may be enough to discourage other developers from risking it." 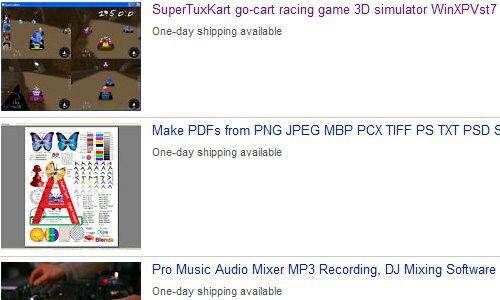 SuperTuxKart is the project I first knew about is being sold by third parties although I can't find any discussions on that topi any more (see comments for info from their side). SuperTux' archives contain a bit of reading material about what problems they had. ILLUSION MAGE!!! THIS IS NOT BLENDER!! Quite a few foss software on ebay too. This seller seems to be specialized in selling foss games and apps while trying to hide their name. Assuming all they do is sell open source software for $6.65, then they earned $14,277.55 in at least 2147 sales since November 2009 (about $950/month). That'd be kind of lame. Side note: I just found a Lugaru fork, which claims the animation data is CC-BY-SA'd, which according to file size (didn't do a diff check) is the original data. The original Lugaru repository's license file states no such thing. I wonder though, would have Lugaru's incident have happened, if they did not put code and data in the same repository? What do you think? And do you know of more incidents of this kind?